Indian runners are unusual-looking ducks with long, cylindrical bodies and upright stances. Their legs are positioned at the backs of their bodies, so they are literally able to run. Indian runner ducks are prolific layers and active birds who love foraging. They rid the ground of pests, making Indian runners a breed of some use to humankind. Indian runner ducks appear to have been around for a long time. Carvings on stones in an ancient Javan temple suggest runner-type ducks may have existed around 2,000 years ago in Indochina. By the 1800s, runner ducks had arrived in Europe where they quickly became popular because of their unique appearance and laying ability. These ducks came from the Indonesian islands, where duck herding had been a way of life for hundreds of years and runner ducks were bred in the thousands. Flocks of 1,000 ducks, in the care of a duck herder, would walk the long distances to the markets. The ducks would forage in the rice fields as they traveled. Each morning the eggs would be collected and sold by the herder, along with any unfit birds. It sometimes took 6 months to reach the market, only the strongest walkers and best layers completing the journey. Indian runners are a light breed, with long, slim, upright bodies and long necks. They have wedge-shaped skulls, with their eyes set high in their heads and straight bills. 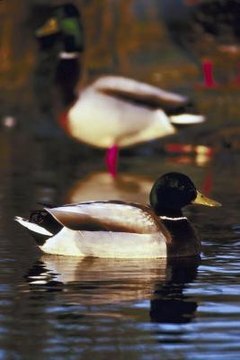 The ducks' strong legs are set well back on their bodies, and they have neat, compact tails. Runner ducks weigh 3 to 5 pounds and they are 20 to 26 inches from crown to tail tip. Runners come in more colors than any other domestic duck. Eight varieties are registered by the American Standard of Perfection, including the original fawn and white, as well as white, penciled, black, buff, chocolate, Cumberland blue and gray. Lots of nonstandard colors exist, such as lavender, trout and splashed, with breeders developing new varieties all the time. Runner ducks are great layers. Birds from good strains can lay in excess of 200 hen-size eggs a year. The eggs can be white or green, and runners can remain productive for five years. They are not considered meat birds because of their small size, but they are tasty to eat with a flavor similar to that of wild duck. Runner ducks tend to be nervous and excitable, but with calm handling, you can tame them. They are great foragers, happiest with plenty of space to root about for slugs, snails, insects and anything edible. Runners, of all ducks, have the least need of open water but will need a bucket of fresh water they can immerse their heads in to keep their eyes and ears clean. Runners cannot manage sustained flight but will scramble over 2- to 3-foot fencing if food is an incentive.